In 1991, wildlife lover Hutto hatched, imprinted, and raised two clutches of wild turkey eggs, entering their wild world for over a year. He later published a book about this experience, Illumination in the Flatwoods: A Season Living Among the Wild Turkeys (1995). 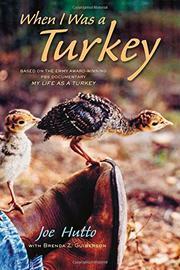 A re-creation of his experience by actor Jeff Palmer became a PBS documentary, My Life as a Turkey, the basis for this chronologically told account, which is chock-full of details about turkey life and even some deaths. Co-written with Guiberson, the third-person narrative reflects Hutto’s thoughts at the time. It’s both a record of an intense experience and a reflection on human relationships with the natural world. After the eggs hatched, the new “mother” spent most of his daylight hours watching and exploring with his turkey family, seeing his Florida fields and forest through their eyes. He was especially surprised to discover how much more wildlife he saw as part of the flock. After his jakes and hens had matured and left, he missed the window they offered. He was thrilled when one, Turkey Boy, returned to share a few more months with him before disappearing for good. The author’s drawings and a section of photographs complete the package.